Our Stolen Future:Transcription factor CREB activated by low level Bisphenol A.
Quesada, I, E Fuentes, MC Viso-León, B Soria, C Ripoll and A Nadal. 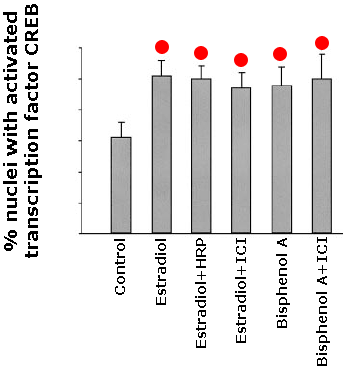 2002 Low doses of the endocrine disruptor bisphenol-A and the native hormone 17ß-estradiol rapidly activate transcription factor CREB. FASEB 16: 1671-1673. One of the centerpiece findings of research into endocrine disruption is the ability of EDCs to turn genes on and off at inappropriate times, that is, to alter the pattern of gene expression. During normal development, the right sequence of gene activation can be as important as whether or not genes are there in the first place. In this paper, Quesada et al. identify a new pathway for the ubiquitous contaminant, bisphenol A (BPA) to interfere with normal gene expression, and to do so at extremely low levels of exposure. Moreover, the pathway they have discovered is one that is involved in a wide array of important control mechanisms for normal development and function, in people. Affected genes include key elements of the way that long-term memory is stored, that brain development is controlled, and that weight is regulated. They have discovered that bisphenol A activates a new type of estrogen receptor located on the surface of the cell membrane. Attention until now has focused on bisphenol A's interaction with the classic nuclear estrogen receptor, located within the cell. The experiments carried out by the research team indicate that bisphenol A is just as powerful as the natural human estrogen, 17ß-estradiol, at activating this cell membrane estrogen receptor. This equipotency undermines one recurring argument against the possible impact of "weak" estrogen mimics like BPA, which are far less powerful at binding with the nuclear estrogen receptor than is estradiol. What did they do? Quesada et al. worked with a line of pancreas cells isolated to live in test tube conditions. This sort of preparation is the standard way for cell scientists to explore biochemical pathways. In the experiment, they exposed the cells to different substances, including bisphenol A, and looked to see whether a specific transcription factor, called cyclic AMP response element binding protein, or CREB, had been altered into the form it takes to activate genes. To detect the transformation into the activated form (called phosphorylated CREB, or p-CREB), they exposed the cells to an antibody known to react only to p-CREB, not unphosphorylated CREB, and determined the number of cells that responded positively. What did they find? 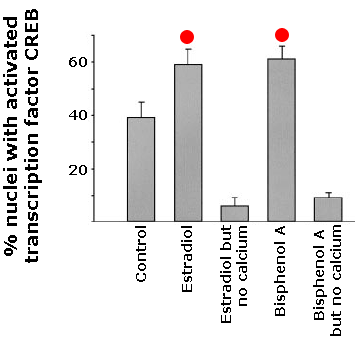 At a concentration of only 1 nanoMolar (approximately 0.23 parts per billion) both estradiol and BPA increased the percentage of cells with p-CREB by 35% after only 5 minutes' exposure (graph below). First (graph to right), they repeated the experiment but left calcium out of the solution in which the cells were bathed. For both estradiol and BPA, this decreased the amount of phosphorylization to well below the control. They took this to indicate that part of the process of CREB activation requires an influx of calcium into the cell (consistent with previous information about CREB). Adapted from Queseda et al. They then added (graph to left) another twist to the experiment, adding a chemical (ICI 182,780) known to interfere with estradiol (and BPA) binding to the nuclear estrogen receptor. This had no effect on the outcome. If the activation of CREB were dependent upon the classic intracellular estrogen receptor, the chemical would have eliminated the response. But the addition of ICI did not diminish either estradiol's or BPA's impact. Finally, they replaced simple estrogen with estrogen bound to a molecule (horse radish peroxidase, HRP) which is unable to pass through the cell membrane. Estradiol still had the same effect as before, indicating that its mechanism must be through a cell membrane receptor with estrogen's binding taking place outside the cell on the cell membrane, rather than inside the cell. It involves a new type of estrogen receptor, located on the surface of the cell membrane. It finds bisphenol A to be just as powerful as estradiol in binding with this new receptor. Binding and alteration of gene expression occurs at extremely low levels, low parts per billion, well within the range of bisphenol A found in people today. Research has established that CREB is involved in the molecular basis of long-term memory. Studies with a variety of animals, as diverse as sea slugs and mice, have shown that interfering with CREB activity impairs long-term memory formation. Enhancing it strengthens memory. These results with bisphenol A raise the question: what happens when the memory formation process is stimulated at the wrong time? CREB plays another role in neurological function, controlling key aspects of how the brain develops. Normal brain development involves an interplay of neuron growth and neuron death. Nerve cells grow and make connections with other nerve cells. Some of those cells, however, die in development, in a process called pre-programmed cell death (apoptosis). Apoptosis is a natural and necessary part of brain development. In the developing brain, target cells that develop connections with growing neurons exude a chemical signal called NGF. Neurons that receive the signal live. Those that don't die. That's the way the brain ensures the right connections are formed and unnecessary neurons don't stay around. When a cell receives the NGF signal, it prevents the process of apoptosis from starting. And CREB is involved in the response to NGF. It turns out that NGF causes CREB to be converted into its active (phosphorylated) form, which leads to gene expression. So Quesada et al. 's results raise a series of developmental questions: What happens to a developing brain when CREB is phosphorylated not by the normal and natural signaling pathways, but instead by an endocrine disrupting contaminant? Finally, in an entirely different realm, CREB has emerged as an important signal in the molecular events that convert precursor adipocyte cells to adipocyte cells. Quesada et al. 's findings raise the possibility that bisphenol A exposure pushes adipocyte formation faster and farther than would happen without exposure. Indeed, previous experiments have already suggested this, without knowledge of the signaling mechanism. In combination, these studies implicate bisphenol A in the molecular and cellular basis of obesity: how many fat cells a person has, and how much fat they contain, is the central determinant of obesity. These experiments were carried out in mouse pancreas cells in cell culture, not in living mice, and the proposed mechanism for bisphenol A's effect is new. They clearly require replication and further study to understand the full implications of the results for human health. Yet at the same time, they add to a rapidly growing body of data that plausibly connects bisphenol A to an extraordinary array of important health endpoints, at levels that are now known to occur in people. Efforts to reduce human exposures should commence immediately.